I’m on the mail train to Jaffna, my head stuck out the window with repeated clacking of the rails, sway of the carriage and unstoppable motion into places unknown – here I remember what it is to travel. Then the moments of euphoria pass, and you’re cramped into an uncomfortable night on a wooden seat between bags and grandmas in the tropics. I step out of the newly-built Jaffna Station and eat a breakfast of curry puff pastries and milk tea in a local café opposite with the newspaper-toting early birds of Jaffna. The city itself feels closer to an overgrown fishing town. I finish up and walk the streets like a schoolboy off to class past old ladies sweeping their front yards with wooden brooms and magpies swooping from the trees. But under the small-town quaintness the scars of war still fester. I encounter two soldiers intently scanning the side of the road with a metal detector as if probing for loose change. “Drop something?” I ask them as I pass by. They smile and shake their heads, “Mines.” Then they continue on with their task, passing the detector over the same ground I just walked on my way from the station. I can see grand colonial edifices pockmarked with shell holes and cracked masonry from stray bullets and shrapnel damage. It lends the town the atmosphere of a recently reoccupied graveyard. But things are not as bleak as they may seem. Schoolgirls still ride home in white-uniformed clusters atop antiquated bicycles by the sea; new housing projects are springing up in the gaps left by the bombed-out husks of houses wearing coats of pastel-colored paint. The rebuilding effort is well underway and the overall atmosphere is a hopeful one, in the slow-moving, old-world sense of long tropical days and fisherman drying out their nets along the roadside for another day on the boats. I find a small room in a white-colonnaded villa called Sarras set amongst small shady grounds of potted botanics and dozing hounds of leisure. Waiting for the manager on a chair fashioned out of a planed and lacquered tree stump, I watch the cross- eyed groundskeeper stalk the yard with his watering hose as vintage cars of long-gone epochs rust under hessian blankets in the grass. The only other guests are a family of French dining in the hall. 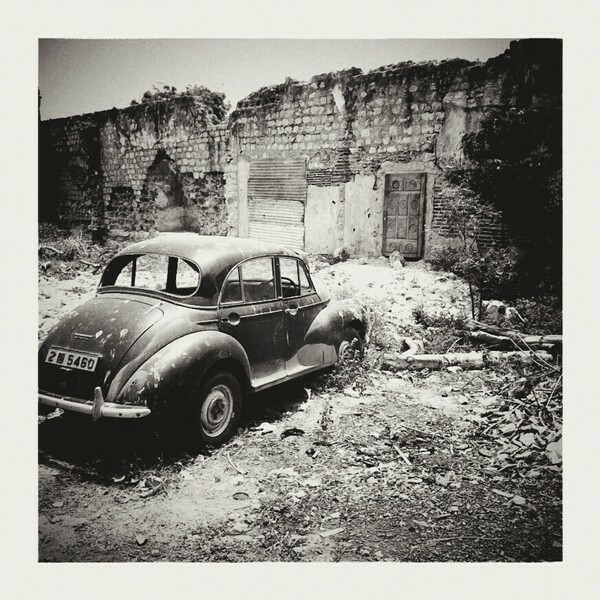 In the late afternoon I take my postcards down to the melancholic ruins of Jaffna Fort on the small promontory at ocean’s edge. It’s the best spot in town to soak up a maritime sunset coming down over the outlying marshy islands. Standing atop the walls, it’s not difficult to recreate in my mind the former majesty of this imposing structure. 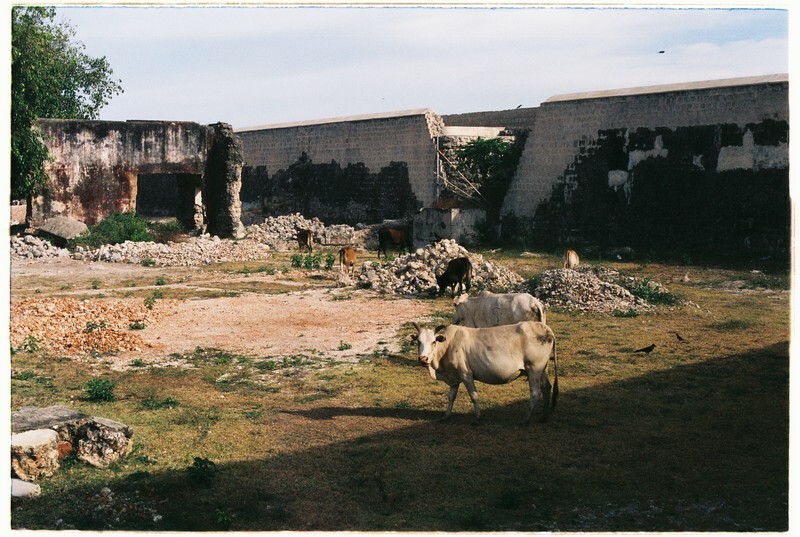 Cows and soldiers mill about the former courtyards and structures once housed within, though sparse are the remains, just some jumbles of stone and occasional retaining wall still standing. I watch a family of shrouded Saudis on holiday enter the arch of the fortified gate below the walls, nearly all of them young girls in burqas, like black sheep at the heels of their shepherds, herded in through the gates of the old city. Rested against the ramparts as a group of school children on excursion picked their way across the rubble, I pen postcards back to Saigon. 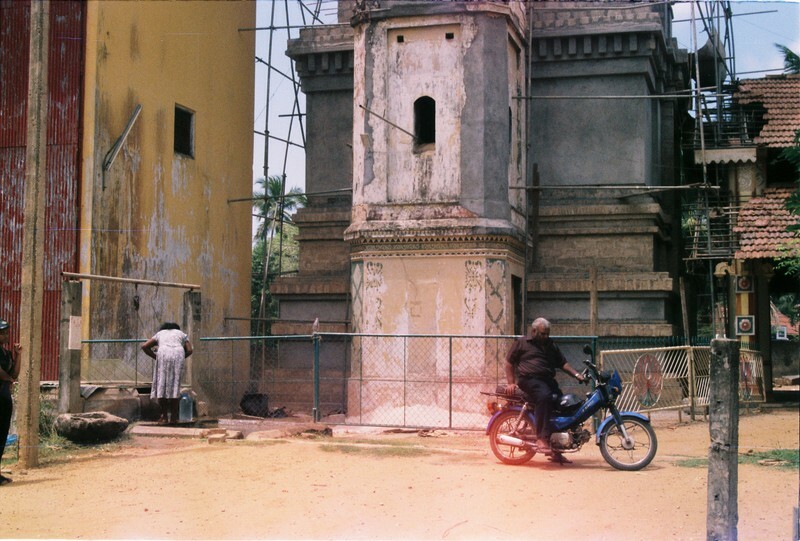 Much of Jaffna’s charm comes from the friendly folk you find strolling its sleepy streets, walking their bicycles or putting by on scooters. I encounter Mr. Brody, a wise wet-eyed doctor walking his bicycle over the train tracks, and he wishes me a good day. Where am I headed? he inquires, and might he be of any assistance in helping me find my way? His granddaughters are waiting for him at home with their homework open before them on the cool tiled floor, Tamil television music playing out of somewhere, some other room. Crows call out the open window and an old woman sweeps in the yard, back bent to her broom. The doctor tells me of the years he spent teaching science and mathematics in Nigeria and later, London. In his beige pressed shirt with pens in pocket and loose-fitting coffee brown slacks, Mr. Brody is a refined old gent even in his retirement. He bids me farewell at the crossroads and continues on his way. I rent a scooter from a nearby guesthouse (it takes a little convincing on my part in lieu of a license, and a promise to pay in full any fines should I have the misfortune of incurring one) and cross the man-made causeway by the fort to the nearby Kayts island, camera draped around my neck and rolls of film stuffed into my pockets in search of Kayts Fort, which I’d seen depicted on a postcard. There are five islands in all, joined to each other by land bridges and a ferry crossing. These are not, however, islands in the classic tropical sense of swaying palms of white sand idyll, but rather sand-ringed swamps and marshlands, Jaffna’s outlying wetland areas. Its geography is in many ways reminiscent of the Mekong. The road to Kayts, contrary to my expectations, is a procession of shattered houses by the high road built atop the marsh, like a Roman highway of rotting crucifixes. The destruction out on the islands is of another order. 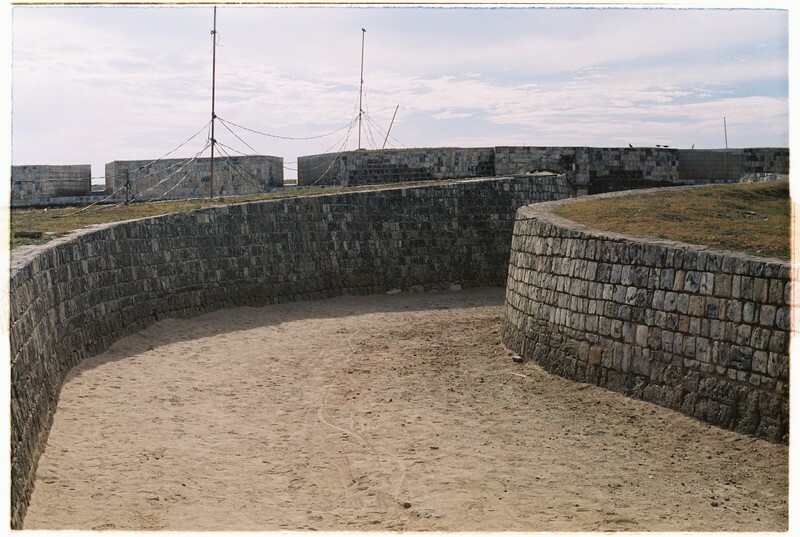 The area saw systemic bombardment during the war years, and every dwelling suspected of harboring arms, which must have been nearly every structure on the island, was shelled into oblivion. Even the black-trunked palm trees are pocked full of bullet scars. Kayts town itself, perched at the tip of the island, as I soon discover, is little more than a small cluster of shell-shocked colonial-era shophouses and a haunted church, which I trudge through the long grass to get a closer look at, all the while very conscious of the warnings bandied about online not to wander from the main roads for fear of lingering landmines. 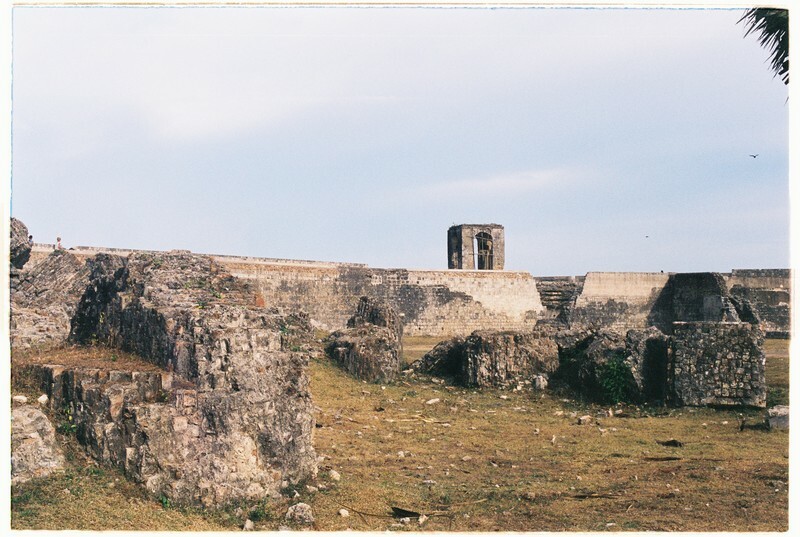 I find my fort floating out to sea, a tiny fortified islet espied from the rocky shore atop my rented scooter through the parted reeds – Kayts Castle still standing tall over the ruins of the marsh. I content myself with this brief impression as the sky grays over and threatens with rain. Back then along the desolate run, past road crews and tankers re-tarring the asphalt, hollowed out as one returning from the banks of the Styx. By rented scooter, foot and bicycle, I find myself returning along the coastal road alongside clusters of smashed houses sprouting weeds from the rubble, past new housing developments, catamarans drawn up onto the shore, fisherman’s nets drying out along the road, and at the end of it all, the enigmatic skeleton of Jaffna Fort like a tombstone at the land’s end. This section of Jaffna more than any other, south of the old town, predominately a Tamil neighbourhood, bears the greatest concentration of devastation, and presents itself as somewhat of a rambling slum by the sea, thriving with punks and fishing families, a definite contrast to the rest of the city. Rheumy-eyed fogies sit out on their porches, idly extolling in their senility as bare-footed children play shirtless in the street. The military here make their presence felt the most keenly, patrolling with their weapons and milling about on street corners like bored police officers, with the rare occasional armoured vehicle or troop truck spotted on the streets. Overall though, it is an occupation in its dwindling stages. 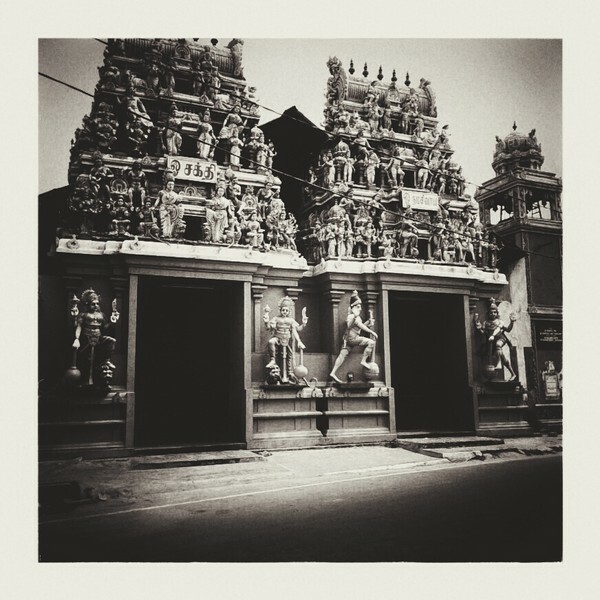 Relations, or so it seems on surface level meandering along Jaffna’s streets, have become for the most part normalized after decades of bloody conflict and insurgency. The civil war officially ended in 2009 with the fall of the Tamil Tiger’s last stronghold, Kilinochchi, with tens of thousands displaced. 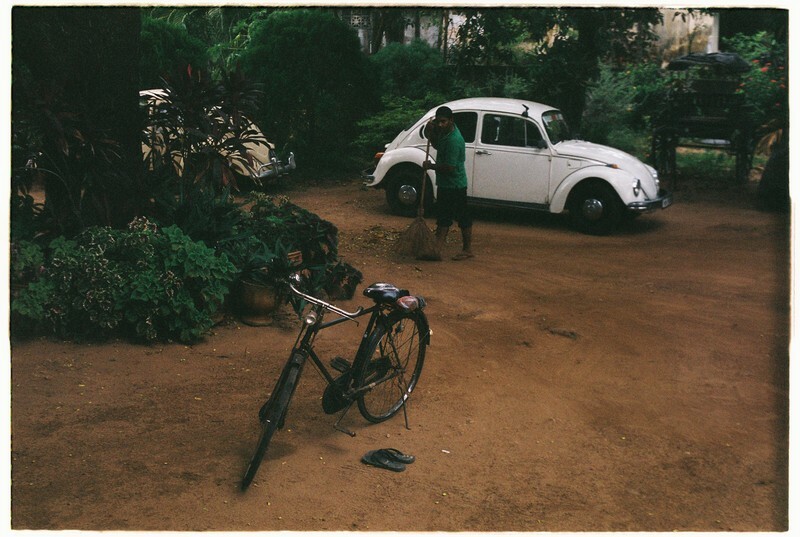 But where one would expect to find a residual climate of horror and fear, one finds instead the domestic hum of small-town commerce, of children riding their bicycles to school, and the bland duskiness of suburban streets in the heat of equatorial afternoons. People just getting on with their lives. The cyclone fences are being rolled back, flowers and ferns are being planted at the green fences of the remaining garrisons, thalis are being eaten at cafes around dim tables by men with orange painted into their beards. Hindus at leisure in the heat. Later I hop on highway buses down to the tea country to escape the heat. 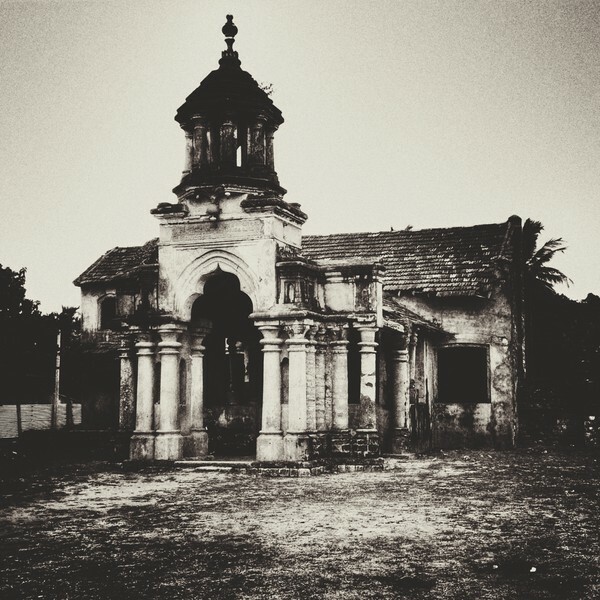 To the lonesome traveler who ventures there, Jaffna paints itself as a meditative, melancholic place. On the close side of calamity, yet flourishing with splashes of new vitality, much as a blackened forest regenerates new saplings after the flames have gone.